Its seems like only yesterday, but for these last ten isuues I have voiced my collectible knowledge and opinions within these pages. I will be closing down the Collectible Shoppe and heading out. Someone wise once said, "When you close a door, you open a window." So fear not, I will still appear in these pages in feature articles down the line. This is an aniversary issue. So, let's raise a glass of good cheer, share memories and good times, and toast the successes we have had and will have in the future. This toast isnt complete without thanking the most important members of the party  you, the readers, who point out the winning ways of this magazine. Before someone thinks there are sour grapes or problems because Im leaving, there aren't any. Most of the staff, who are my comrades, will still be my comrades. Im just moving into other ventures such as a column in Truckers USA. However, at conventions, I will still be very proud to sign copies of this magazine at a moment's notice. Some of the enormous film blockbusters set to be released to your local multiplexes and collectible shops over the summer are: Walt Disneys newest animated motion picture The Lion King, the live action version of The Flintstones, the remake of the TV western classic Maverick starring Mel Gibson (Hey Im allowed a guilty pleasure! ), Jim Carey in The Mask based on the comic book characters, and The Shadow based on the pulp novels and the radio shows. The Mask, The Flintstones, The Lion King, and The Shadow have comics adaptations of the films. The Flintstones, The Lion King, The Shadow, and Maverick will all have action figures and playsets. Topps cards is producing trading cards of The Shadow and The Flintstones films. All five films will have soundtracks albums. I especially want to hear The Flintstones soundtrack - you know, old fashion Rock music from the stone age. One of the giant superstars of the National Basketball Association is (Sir) Charles Barkley. The current master of the hoops is featured in not just one, but two comic book projects from two different comic companies. In Sir Charles Barkley and the Referee Murders (Hamilton Comics), Sir Charles is accused of killing referees. Before you say this is not a science fiction collectible, the text of this comic adventure is written by Star Trek Log scribe Alan Dean Foster and drawn by E-Mans creator Joe Staton. Not a bad pen-and-ink team for a basketball superstar. Hamilton comics has captured the real Barkley in the proper manner befitting the prevailing superstar of the NBA. Mike Baron scripted the ultimate superhero teamup that this columnist has seen since Spiderman worked with John Belushi and the Not Ready for Prime Time Players in Marvel Team Up #74. Godzilla vs. Barkley (Dark Horse comics) is a sport and comic collectors collectible. The storyline is comic magic. Godzilla vs. Barkley is in the same vein as giant-sized DC comic special Superman vs. Muhammad Ali in the early 1980s. This cross-over Superman comic book is now valued at $3.00. Because these specialty comics feature our sports heroes, they are often more prized as a personal item to be enjoyed, rather than as an "investment" sealed in sterile plastic. What's a mammoth column without a dinosaur item? In the first issue of Movie Club veteran filmmaker and the first publisher of Cinemagic magazine, Don Dohler, takes the readers into examinations of new and old filmmaking. A scene in Jurassic Park features a banner proclaiming "When Dinosaurs ruled the Earth." This magazine goes one better by comparing the old dinosaur films of the past with the fictional park. Arresting reading written in a style you dont have be a fourth year film student to understand and enjoy. This magazine also covers science fiction, fantasy, and horror films of the present and the past, both professional and amateur. I hope they review Way Bad Stone soon, I enjoyed that amateur endeavor. Six issues of the Movie Club are $15.75, 25% off the cover price. To order Movie Club, 12 Moray Court, Baltimore, MD 21236. Tell them you read it here! I liked the show Quantum Leap. You could never peg each episode into a certain format. Was it a mystery, a musical, a love story, an adventure tale, or something else? Dr. Sam Beckett, leaping from life to life with his hologrammed friend Al, meant something personal to me. The show was canceled in 1993, but it has spawned an extraordinary soundtrack album (Quantum Leap: Music From The Television Series) of the music from the show. This is due, in part, to the musical talents of actor Scott Bakula. So, (pardon the pun) leap to your favorite record store, get a copy, and relive this Emmy award-winning show again through its music. If you dont, youll be OH BOY-ing yourself to death. If youre a fan of modern horror, check out two books of film history on two film giants. Lon Chaney: The Man Behind the Thousand Faces (The Vestal Press) is a tribute to an actor / makeup genius. This silent-screen star of Phantom of the Opera and Hunchback of Notre Dame, still leaves an imprint on science fiction and horror fans, four decades after his death. After you read this book, you may understand why. Includes the 111 minute documentary "Flying Saucers over Hollywood"
Director Edward D. Wood, Jr. has a couple of claims to horror and science fiction fandom. He was the writer and director of Plan Nine From Outer Space. According to the Golden Turkey awards, its the worst science fiction movie ever made. 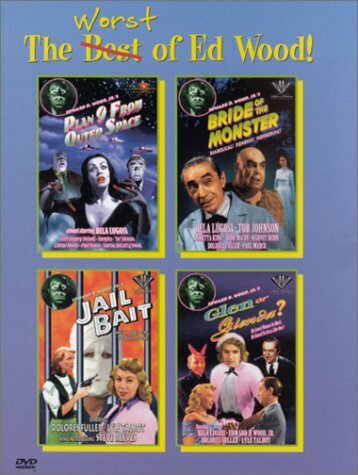 He also gave fandom many schlock cult classics including Glen or Glenda, Bride of the Monster, and Night of the Ghouls. These B-grade films have become Midnight Madness masterpieces. In Rudolph Greys Nightmare of Ecstacy (Feral House Press), Woods life and filmmaking are examined through interviews with actors, family, and friends. I'll be Con-curring about That! On April 23 and 24, I will be a guest at the Greater Philadelphia Star Trek Expo with Avery Brooks and Arne Starr. After that I will be taking a convention intermission to attend the American Booksellers Association convention in Los Angeles at the end of May. In July, I will be back on the convention trail again. Ill be a guest at Castlecon over July 4th weekend. Then, Ill appear at Novacon on July 30 and 31 at the Tysons Westpark Hotel, Tyson Corner, VA with Michael Dorn and Walter Koenig. Of course at all conventions, I will be talking collectibles and will be happy to autograph your Strange New Worlds. Moving in a new space is easy; moving out is hard. There is so much stuff you feel left unfinished. There are so many good-byes I want to say. I need to thank so many people for making this column a success. (And you thought, it was a one person job?) Before I shut out the light on this column, I want to say thanks to a couple of people. To Jo for being an editor/publisher who cares, supports, and gave me the chance to review my kind of science fiction collectibles. To my wife, Evelyn, who hides my shadow so she can keep me on an even keel, especially when the waters are rocky. To all of you who have taken this collectible column to your heart, by voicing your opinion, Thank you.